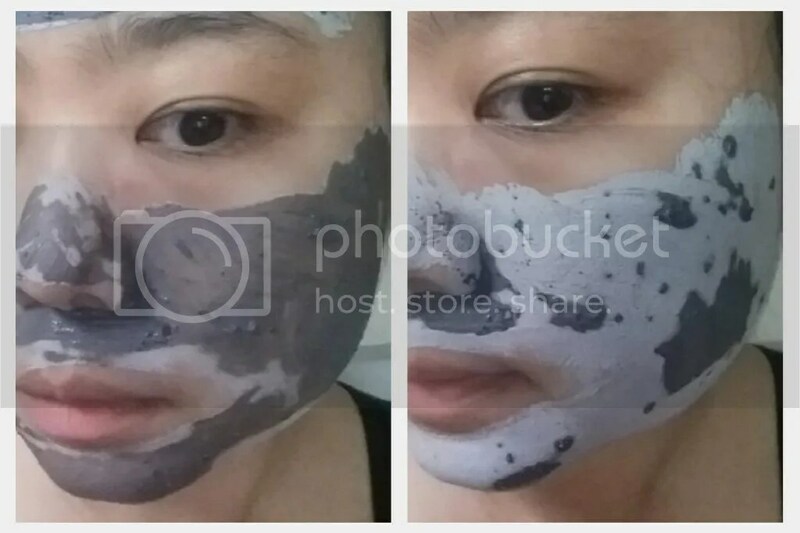 I got my hands on a sample of this Glamglow Supermud Clearing Treatment, which is so hyped up in the beauty world. Needless to say I was totally dying to try it but it is also very expensive so I’ve been holding off my purchase, so I was so glad when it turned up in a beauty box. From the name it’s a mud mask obviously; I find it so cool that it dries to a different colour – from a blackish grey when wet to a very light grey when dry. When it is dry it gets so hard and tight; I could barely move my face! It feels like all the gunk is being sucked out of the face as the mask dries. After it’s totally dry I just rinse it off – it’s black so it can get messy! I must say that this is definitely going on the top of wish list! My face looks so clear after just one use… I’m not sure if I will see the same effects with subsequent uses but my first definitely showed a lot of improvements. I have a couple of zits but they dried out or seem to have shrunk! More please! It’s Monday Masking time! 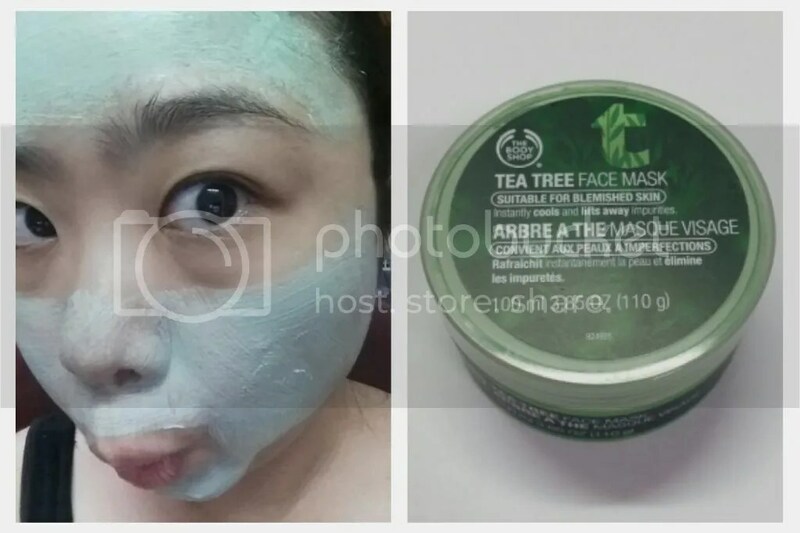 Today we’re revisiting a mask that I’ve had for quite awhile – I’ve also reviewed this The Body Shop Tea Tree Face Mask a few months back here. I didn’t particularly liked it back then, and honestly, I’m still not feeling the love now. I don’t hate it and I still can’t stand the smell, but I will still use it up because while it isnt doing very much for my skin, it doesn’t do any harm either. One thing though – this takes ages to use up. If it does something for your skin, then it’s really great value. I’ve used it dozens of times and it is still more than half full! Have you tried this mask and what are your thoughts on this? So to brighten up your Monday, here’s my imitation of the Panda on the packet – with a big face, little slit eyes and dark circles… I think I did a great job, right? Anyway, it’s Monday Masking time again! Where I show you my masking journey. And this time it’s a pair of eye masks. I admit that I picked up this packet of eye masks because the packaging was cute – I saw the pandas, thought it really looks like me on a bad day, and I had to get it. It costs SGD3 from Sa Sa for 2 pairs in the packet, which is quite reasonably priced. Honestly, I don’t think this did anything other than look amusing – the masks felt like sticking stickers on my eyes. It’s actually dry, with an adhesive side. A little like those slimming patches, and less like a facial sheet mask. It’s a little weird, and I definitely still looked like a panda afters. I’ve featured this range of mask in tons of my empties post and yet I have not dedicated a single post to them! 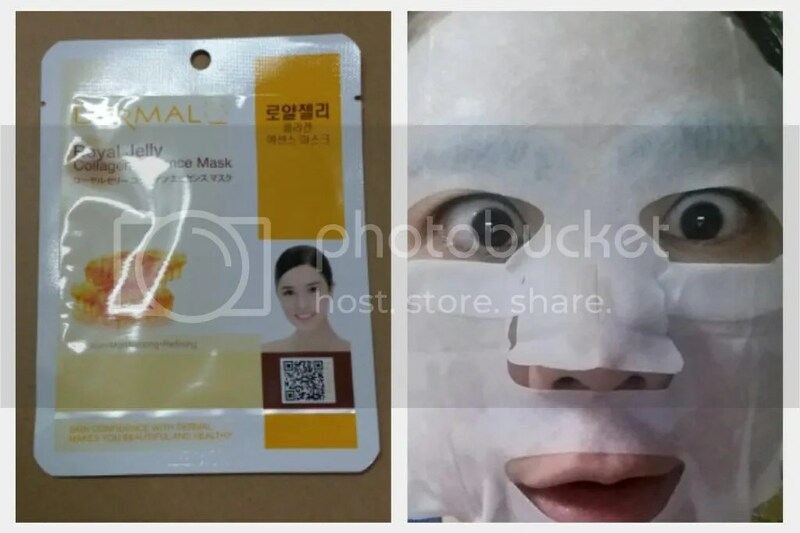 Dermal masks are one of the most affordable masks that I can get my hands on – if they’re on sale, you can get a big bunch of them for slightly less than SGD0.50 each including shipping from Korea, which explains why I have a huge stock of it. I find most dermal masks the same – the size of the sheets and packaging are definitely similar; the biggest difference lies in the scent. The Royal Jelly Collagen Essence mask does not have a scent, unlike some (but not all) of the fruitier ones from the line. The sheets are all full of essence – wet enough but not dripping everywhere. I don’t think the impact between the different types of sheet masks differs a lot – they make my skin feels more moisturized, but the claims of ‘anti-aging’ or ‘whitening’ effect on different masks cannot really be seen. I honestly don’t expect to see all that with one mask session; masking is a just relaxing ritual that I love. Do you use sheet masks regularly too? It’s monday masking time! 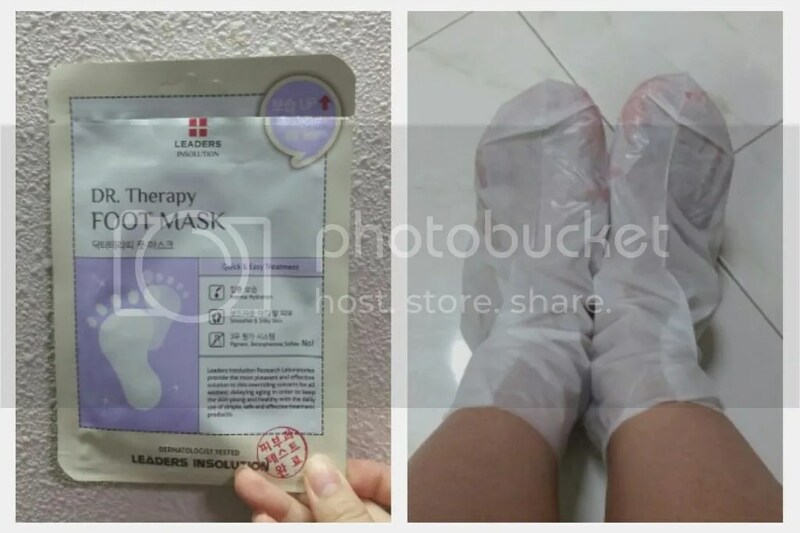 This time around I wanted to try something different – a foot mask! This is actually the first time that I’m using a foot mask; my feet has been really dry with rough and hard edges so I’ve been hunting up and down for something that could help. Like many people with a 9-5 job spanning Monday to Fridays, Monday is my least favourite day of the week and I usually don’t schedule anything after work on Mondays, preferring to stay at home for a good ‘home spa’ session to cheer myself up – mostly with a good long shower followed by some kind of facial mask, sometimes a foot soak, with a book or tv show. Today’s mask of choice is the Vardi & Migdal Gold Eye Mask. I believe I got this from Sample Store some time ago so I did not pay for it besides the shipping fee. 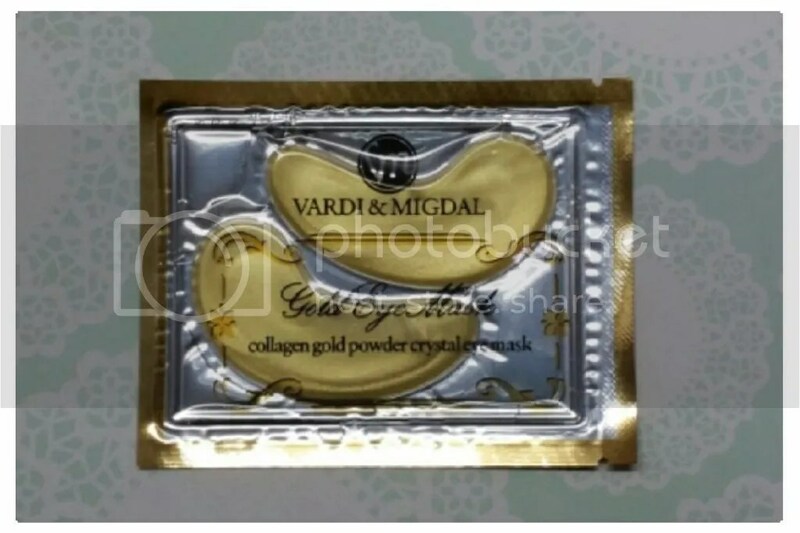 This eye mask claims to be formulated with collagen, gold powder and active anti-aging ingredients which instantly moisturizes, rehydrates and regenerates the delicate eye area – and with daily use, it can reduce the appearance of fine lines and wrinkles around the eye area, minimize eye-bags and fade dark circles. 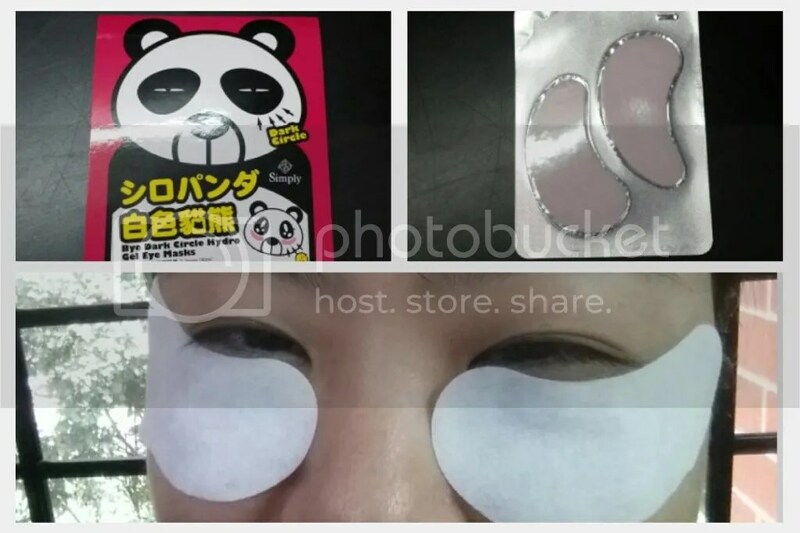 I did enjoy the texture of the eye mask – it feels a little jelly like and was cooling to the skin; I felt pretty refreshed after using it. A quick check on the Sample Store page showed that 1 pair of this costs S$20! Holy cow! If I can afford to use a $20 eye mask on a daily basis as mentioned in its claims, which translates to over S$600 a month, I must be rich and don’t have to work anymore… then why would I still have eyebags?! I’m sorry but I have to say – I can’t afford to use this daily to observe if its claims are true, and I doubt that it will be worth it to try.